The Conservative Brawler: Remember the Auto Bailout? 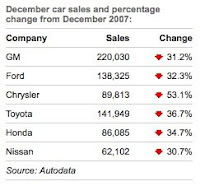 Remember the ~$13 billion Auto Bailout? Well, just like the first $700 billion bailout of our banks and loan agencies, it seems to have done absolutely nothing for "stimulation." Relatively minor players Subaru and Hyundai posted gains (that's right) of 8% and 14%, respectively. And, not surprisingly, about 1/2 of the $700 billion bailout is relatively unaccounted for. No one can tell us where the government spent our tax money. It just up and vanished like a fart in the wind! Here's an idea, let's stop throwing money at the problem. It doesn't seem to be working. Watching the Democrats run the economy is like watching Hollywood celebrities talk about politics: they have no idea what they're doing, but they think if they keep talking no one will notice they're clueless.